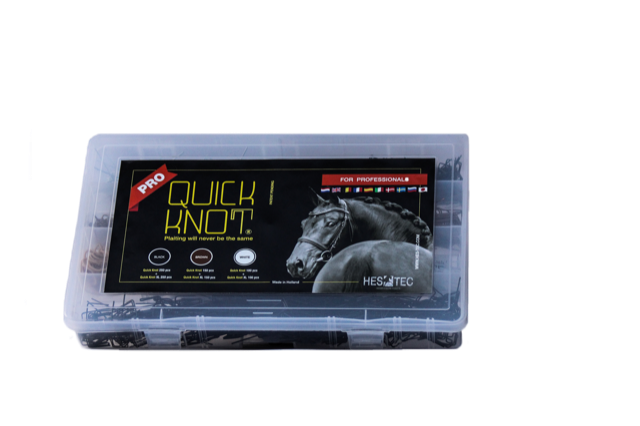 The Quick Knot Probox is a complete must-have box for every professional stable. Ideal to speed up the time-consuming job of braiding. Whether it concerns competitions, inspections or presentations, with the well-filled Probox you have everything at hand. The Probox contains 1000 Quick Knots® in the colors black, brown and white (in M and XL version), a mane comb and rubber bands. With the help of the Quick Knot® you have guaranteed a nice and sturdy knot in seconds. Quick Knot®, Why not?